NEPL plays on several locations in the Boston area. All of them are wet Astro turf. The three-acre site at the corner of Babcock Street and Ashford Street was selected for the development of an athletic field on a deck above parking, thanks to a $3 million pledge from Boston-based shoe manufacturer New Balance. 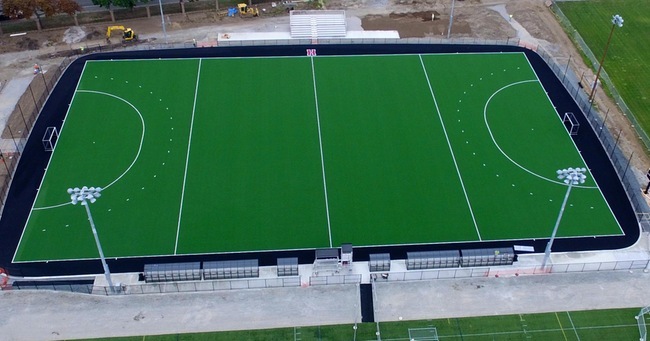 The design allows for use by various field sports, but the playing surface is primarily intended to support the Women’s Field Hockey program for competition. The parking level accommodates 340 vehicles and the field level features bleacher-style seating that accommodates 500 people. Construction began in the summer of 2012 and was completed in August of 2013. While not LEED eligible, the project closely followed LEED guidelines. The field incorporates many sustainable features, including rainwater harvesting, drip irrigation, and storm water management. PARKING: Street parking available around the field on Babcock St, Ashforn St and Malverne St. DO NOT PARK on Gardner St (Resident parking only and you will be ticketed and possibly towed. Paid parking (usually $10) is available at the garage below the field. Ounjian Field is an AstroTurf playing surface and the home of the Tufts field hockey team. The $2.4 million facility features an Astroturf surface, a water system, lighting, perimeter netting, elevated bleachers, team areas and a press box. In addition to serving as the home of Tufts Field Hockey, the field will provide valuable outdoor space to Tufts' intramural, club and recreational sports programs. The field is located among the field across the street from Cousens Gymnasium, beyond Huskins Field and next to Bello Field. In September 2016, Harvard athletics unveiled the new home of the field hockey team, Berylson Family Field Hockey Field. The facility hosted its first event September 2, 2016, with the Crimson facing-off against Holy Cross under the lights. Located north of the Beren Tennis Center, the new field features an APT Poligras Platinum Olympia surface that is FIH (International Hockey Federation) National certified along with spectator seating, team and media areas, lights and scoreboard. Berylson Field is just the third field in the U.S. to use this type of playing surface, the exact turf that was used in the 2016 Olympic Games in Rio. It measures 180 feet by 300 feet. The spectator seating area has a capacity of 348 fans, with additional standing-room and berm-seating areas. PARKING: Free parking at lot adjacent to Tennis Center and Jordan Field.